"This is a drop cookie. I have been making it for over 35 years. It is the first cookie I ever made!!!" Cream butter to consistency of mayonnaise. Add sugar gradually, while continuing to cream. Add eggs one at a time, beating well after each addition. Add vanilla and beat until light and fluffy. In a separate bowl, mix and sift flour, salt, baking powder and baking soda. Add dry ingredients alternately with sour cream; beginning and ending with dry ingredients. Drop by teaspoons or tablespoons depending on the size cookie you want. Sprinkle cinnamon-sugar mixture over the tops of the cookies. Bake for 8 to 10 minutes. Really great Taste.... I used frosting instead of the cin.and sugar. 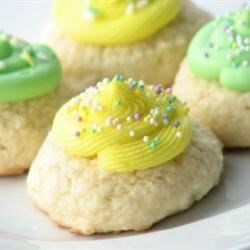 loved the Cookies...they get really puffy but still good!!! This is a great pancake recipe, but I was looking for a sugar cookie recipe. Oh well. Back to the drawing board.